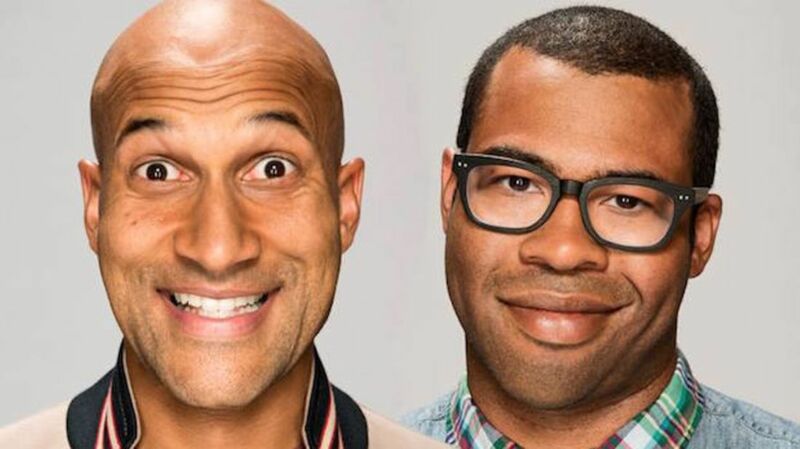 Since Key & Peele, their aptly titled hit Comedy Central sketch show, debuted to 2.1 million viewers in 2012—the largest premiere in the network’s history since the 2009 debut of The Jeff Dunham Show—Keegan-Michael Key and Jordan Peele have become comedy demigods. In a mere five seasons, the comedy duo has already managed to work with (and also turn down) President Obama, win a Peabody Award, and be recognized with eight Emmy nominations as well as a nod for Outstanding Comedy Series from the NAACP Image Awards. The duo even teamed up to play a pair of FBI Agents (Pepper and Budge) on FX’s hit movie-turned-series Fargo. Yet the end is near for this groundbreaking series; in July, the duo announced that the show's current season will indeed be its last. And while that may mean the end of Key & Peele, the series, it does not mean the end of Key and Peele, the collaborators. “There will be Key and Peele productions coming up,” Key told Variety. In the meantime, here are 14 fun facts about Key & Peele that’ll impress anyone in your "Intro to Improv" class and beyond. 1. KEY AND PEELE AUDITIONED AGAINST EACH OTHER FOR A SPOT ON MADTV. 2. KEY AND PEELE "FELL IN COMEDY LOVE" WITH EACH OTHER AT SECOND CITY. According to a story they told Jimmy Kimmel, Peele first encountered Key when he witnessed the comedian do his Coach Hines character at Second City way back in 2003, when Peele’s troupe, Boom Chicago, was visiting from Amsterdam. When it was Peele’s turn to perform, Key marveled at his Ute bit. They’ve admired each other ever since. 3. THEY ALMOST CALLED THEIR SHOW BEIGE. Before settling on the rather straightforward Key & Peele, the pair experimented with several different titles for their Comedy Central show, including Beige. Ultimately, they went against it. “It sounded silly or it felt stupid, because we were trying too hard," Key told The AV Club. “You don’t want to try to get a laugh in the title, because if it doesn’t work, it’s the equivalent of taking a super-wacky picture," Peele added. "You don’t want to put a rubber chicken in your mouth." 4. THEY SHOT A CAMEO IN THE WEIRD AL VIDEO “WHITE & NERDY” YEARS BEFORE THE SHOW STARTED. It’s hard to picture a time in life where Key and Peele would appear in a music video that referenced MySpace. But it happened, and you can thank Weird Al for that. In the 2006 video for “White & Nerdy," Key and Peele play a couple of gangsters riding around in a Chevy Impala who are scared off by Weird Al’s creepiness. 5. THE DUO CREDIT PRESIDENT OBAMA WITH GETTING THEIR SHOW ON THE AIR. Since then, the duo has actually helped President Obama ride that divide, most recently with Key serving as his “anger translator” during this year’s White House Correspondents' Dinner. 6. ‘SUBSTITUTE TEACHER’ STAR MR. GARVEY WAS SUPPOSED TO TEACH SPANISH CLASS IN THE SKETCH. According to an interview with The Week, the "Substitute Teacher" sketch—which is so popular now that it's going to be turned into a movie—was originally about Mr. Garvey teaching Spanish. "The idea for the majority of the writing process was that Mr. Garvey was teaching a Spanish class, but his experience in Mexico—when he was younger, in the army—was very harrowing," said Key. 7. KEY AND PEELE TURNED DOWN PRESIDENT OBAMA FOR A HEALTHCARE SKIT. Believe it or not, President Obama was looking to work with the duo to make a comedy short to promote his Affordable Care Act, which eventually went to Zach Galifianakis’ Between Two Ferns. "We had to turn [Obama] down," Peele admitted to Entertainment Weekly. "We were making the season." Key added, "We literally couldn't fit it into our schedules." 8. PITCHES THAT DON’T MAKE IT INTO AN EPISODE ARE COMPILED ON THE "CAMP AWESOME" BOARD. Sketches that are funny but don't make it to the show get put into an archive, a.k.a. a huge wall in the executive producers' office, dubbed "Camp Awesome." There, according to Key, “is a little nugget that isn't fully grown yet but the possibility is still there.” Key and Peele have probably written over 600 sketches, only about half of which have actually been shot. 9. THEIR "EAST/WEST COLLEGE BOWL" NAMES WERE MARIJUANA-INSPIRED. Peele told Vulture that the football player names, like Hingle McCringleberry and Donkey Teeth, all come from a little known author, “Mr. Weed.” Peele goes on to explain, “He's an amazing writer.” Adds Key: "We’ve had him on our staff for years. He’s worked with Jordan for, like, 14 years." 10. THE METTA WORLD PEACE SKETCHES MARKED THE FIRST TIME A SKETCH DIDN’T STAR KEY OR PEELE. At one point in the third season, the writers of the show wrote a speech called, "Metta World News," where Key and Peele impersonated entertainers like CeeLo and Kat Williams, but they didn't end up doing the sketch on the air. When the cast and crew found out that Metta World Peace was actually a big fan of the show, an idea clicked: Why not let him do it? Key and Peele both thought it'd be cool, hilarious, and a little bit weird, if Metta World Peace just did it himself. Fortunately, the pro basketball player was game. 11. FOR THE LOOK AND FEEL OF THE SHOW, REGULAR SERIES DIRECTOR PETER ATENCIO WAS INSPIRED BY HBO COMEDIES AND SOUTH PARK. Once Key & Peele’s only director, in an interview with Hey Reverb, Atencio cited Mr. Show, The Kids in the Hall, The Ben Stiller Show, and the general slate of HBO comedies as his inspiration for Key & Peele's “sleek” feel. But it was the Denver, Colorado native’s love for Comedy Central—especially South Park—that inspired him to pursue filmmaking in the first place. 12. ATENCIO DIRECTED EVERY EPISODE UNTIL THE FIFTH SEASON. According to a profile written by Zadie Smith for The New Yorker, Peter Atencio has directed every single episode of the show until the current season's slate, which he couldn’t handle since the network put in a double order of episodes. Unwilling to give up control over the post-production on his own episodes, Atencio gave up a third of the season to other directors. 13. KEY HAS AN MFA AND IS A SHAKESPEAREAN-TRAINED ACTOR. Key wasn’t always a goofball. According to The New Yorker, he actually intended to become a classical actor, even receiving an MFA from the Penn State School of Theatre. In 1997, when he was invited to become a member of The Second City Detroit, he admitted to being a little annoyed. “I’ve got an M.F.A.! A Mother-F***ing-A! I took total umbrage!” Key admitted. 14. THE LONG-LOST DAD SKETCH IN SEASON TWO WAS INSPIRED BY PEELE’S REAL LIFE. Raised by a single mom on New York City's Upper West Side, Peele never really knew his dad. Taking a page out of his own life, Key & Peele aired a sketch in the second season, written by Peele’s former Boom Chicago partner Rebecca Drysdale, about Peele visiting a trailer park to find his long-lost dad. If you think it couldn’t be closer to home, Peele drops it right at his doorstep by mentioning to his father (played by Key) that he now has his own TV show. He wasn’t completely alone, however. “Everything I do now, part of it is the fact that I had television as my second parent. Hours and hours,” Peele told The New Yorker.